What's your take on agents outside of New York? Some of the very best agents I know are outside New York. And not just New Jersey-outside. Really outside...like...yanno...Colorado. Seattle. San Francisco. Those agents blow into town and meet with editors, do the rounds, then head home. Us New Yorkers probably have less face time with editors than they do! Most of my work is phone and email. I have more chances for serendipity stuff than they do, but that's maybe one or two deals a year at most. And I see editors at parties and events too, but in all honesty the last thing I do at those events is talk about work. Mostly we talk about our tattoos. And boys. And maybe books. Maybe. In this day and age, you don't need to be in NYC. 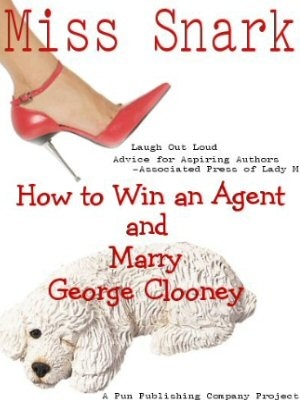 However, Miss Snark is never leaving the city not even (sit down for this one) not even for Mr. Clooney. did you see Mr. C on the Daily Show last week? He only smirked a couple of times. Clooney's nice :-) but I like Shepard Smith on FOX News!